This month we're happy to announce a new version of Xara Xtreme and Xara Xtreme Pro, a major update with over 100 improvements! We mention some of the key new features of V5 below, and of course you can find full information on xara.com. Plus there's a demo site created in Xara Xtreme at xtreme.xara.com (which also serves as an intro to the new web features). 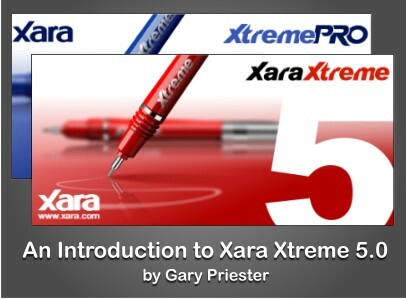 And you can follow Gary Priester's preview from his excellent Xara Xone website, which is our featured tutorial this month. We have an introductory offer on upgrades from V4 which ends on July 31st - so don't delay too long! It's not all about Xtreme this month. We're often asked about the products of our parent company MAGIX and so we've included a new feature introducing some of their products. 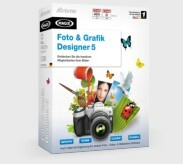 On that note, German readers will be pleased to hear that MAGIX Xtreme Foto & Graphic Designer 5 has been launched today, more below. Finally a big thank you to all the people who have entered the contest to win a place in Gary Bouton's upcoming guide to Xtreme 5. There were a record number of entries but the judges are working their way through them all, and we'll have the result in next month's issue along with a brand new quarterly contest. Follow Gary Priester's introduction to V5, which is our featured tutorial this month. 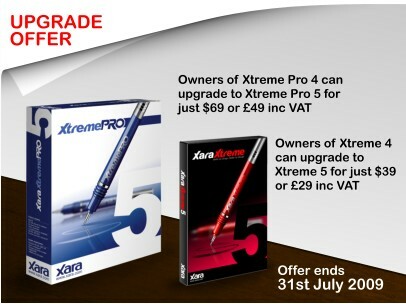 Our great value pricing is unchanged at $249 (or €199 inc Vat in the EU) for Xtreme Pro and $89 (€69) for Xtreme. Upgrades from Xtreme 4 cost just $39 or €29, upgrades from Xtreme Pro 4 only $69 or €49 - and it's even less if you also own Web Designer. But note this is an introductory offer, so don't delay! Check out our upgrade page for other upgrade options. MAGIX is an international provider of high-quality software, online services and digital content in multimedia communication. The MAGIX vision is to integrate multimedia into everyday life for easy use in personal communication. Check out our trials and download now for free! Making music is easy; MAGIX Music Maker 15 offers the easiest start that you could imagine to create your own songs. Download Now Movie Edit Pro 15 PLUS unites highly precise video editing tools with surround dubbing and adjustable special effects! CD & DVD 8 turns your recordings into unique and unforgettable slideshows in a flash. Download Now Audio Cleaning Lab 15 deluxe is your personal audio toolbox, offering unlimited possibilities to edit all kinds of audio material! Launched Today: A new version of Magix Xtreme Foto & Grafik Designer - the German language version of Xara Xtreme - has been released today on the MAGIX website and will be in stores throughout Germany in the coming weeks. This is the direct equivalent of Xara Xtreme 5 (but in German, of course!). You can find out the latest information on the different language versions of Xara software published by our parent company MAGIX - Xtreme, Xara3D and Web Designer in German, French, Spanish, Dutch and Italian - on our website. "Putting websites together and combining text and images really is as simple as editing a document in a word processor." "Excellent page design tools, easy fill and transparency tools." Xtreme and Web Designer have some very handy shortcuts for common symbols: Ctrl+Alt+C for ©, +R for ®, +T for ™ and +B for a • bullet. In Web Designer and Xtreme 5, double clicking on an object in the Selector Tool will select the object and switch into an appropriate tool. e.g. double click on a text object - and it selects the text tool (and places the caret where you just clicked). Double click on a photo and it goes into the Photo Tool. Double click on a rectangle and it goes into the Rectangle tool. And an introduction by XaraXhris to Content Aware Scaling, the clever new photo feature in Xtreme 5.